It was another summer day in New York (meaning it was hot, humid and I was wearing black pants) and I was barreling through the city trying to find the most outrageous ice cream cone in Manhattan. While sweat was pouring out of my soul, I passed several world famous establishments; specifically: Dominique Ansel’s Bakery and Uma Temakeria. While pausing during my sprint to take note of these world-famous eateries, I realized that these two places were famous for their crazy, yet inventive ideas that took the food industry by storm. Creativity is everywhere in the culinary world, but recently it’s been especially evident in pastry. Cronuts, Morning Buns, alcoholic cupcakes – hybrids of traditional desserts have begun to pop up everywhere. It’s incredible to watch pastry chefs push the limit on what we define as dessert. And as of recently, I’ve been swooped up by a chef who’s doing just that. I met Melanie Moss, the owner and head pastry chef of her boutique bakery Mini Melanie, a few years ago. We were both working at Blue Hill at Stone Barns at the time – she as a pastry chef and I as a pastry intern. During my days of endlessly cleaning crates of strawberries, I was able to watch in awe as she moved meticulously throughout the kitchen, creating various breads and pastries for the cafe. By the end of my time there she had taken me under her wing, teaching me everything she knew about baking. Now we’re reunited again, and I’m surprised to find that I’m not done learning. What was taught to me in the kitchen was merely the tip of pastry knowledge which Melanie held. It’s one thing to be able to simply master a recipe, but to be able to take that recipe and twist it, add to it, and alter it to fit an unconventional idea is another. I’ve come to learn that Melanie can not only bake extremely well, but she will also not settle until her pastry visions come to life. 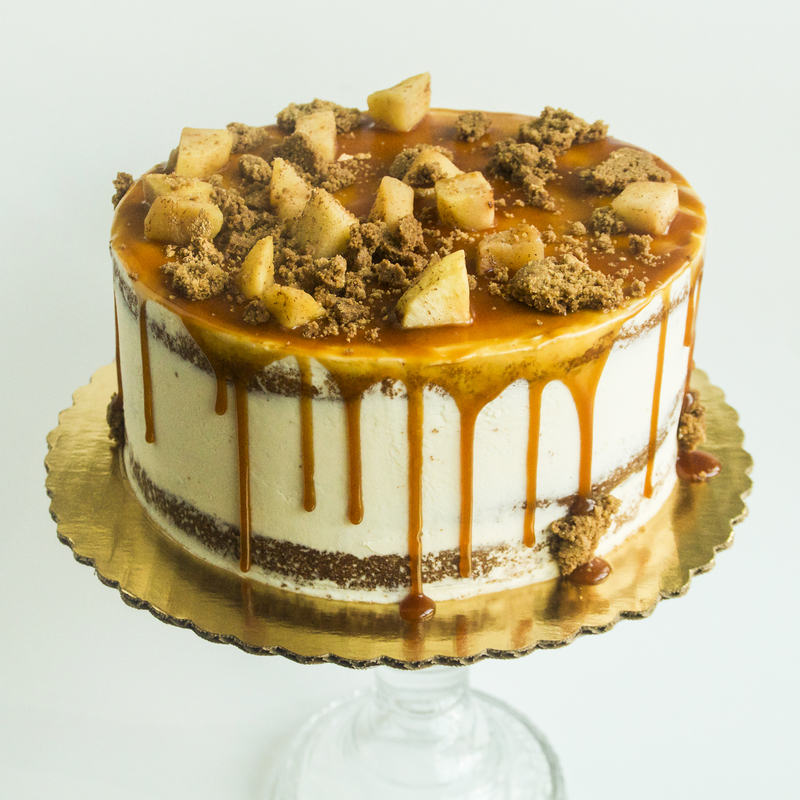 One of my favorite cakes that she’s created is her Apple Pie Cake, which is literally apple pie but in cake form. It’s four layers of apple pie made-from-scratch goodness. Melanie takes tender vanilla cake layers and brushes them with hard cider syrup. Vanilla buttercream is spread evenly between each layer and generous chunks of cinnamon-sauteed apples sink in the buttercream. 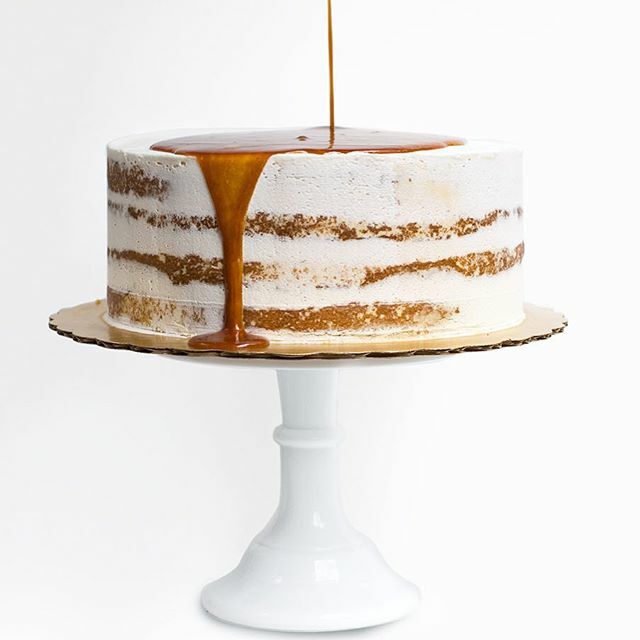 The cake is iced naked-style and coated with dripping salted caramel. Melanie adds sea salt on top, more sauteed apples, and an addictively crunchy cinnamon streusel topping. It’s an amazing experience to try it not only because it actually tastes like the real thing, but it also embodies what Fall should taste like. It’s this type of outside-the-box thinking that makes chefs like Melanie stand out, and ultimately succeed, at what they love to do. *Cakes can be prepared up to two days in advance, cooled and wrapped in plastic wrap and refrigerated on a flat surface. *Apples can be prepared up to two days in advance and st ored in the refrigerator. *Caramel can be prepared one week in advance and stored covered in the refrigerator. Rewarm to recreate our signature drip n the microwave. *Streusel crumbs can be mixed and baked off up to two days in advance and stored in a closed container, at room temperature. *Make buttercream several hours or the day before, and leave at room temperature, unrefrigerated. *Store syrup in the refrigerator for up to three weeks. Preheat oven to 350 degrees Fahrenheit. Butter and flour two 9-inch cake pans. In the bowl of a standing mixer with the paddle attachment, combine butter and sugar and mix until light and fluffy. Add in the eggs slowly, followed by vanilla. Mix dry ingredients together and add in, alternating with the buttermilk. Scrape down the sides of the bowl and mix well. Divide between two pans and bake for 20 to 25 minutes, until lightly golden. Set on a wire rack to cool for ten minutes. Gently unmold and let cool to room temperature. Cook butter in large nonstick skillet over medium-high heat until beginning to brown. Add apples and sauté until tender, about 9 minutes. Add all remaining ingredients; stir to blend. Place sugar in a 4-quart pot and turn heat to medium. Carefully watch as the color changes within two minutes, looking for a medium amber color, shaking the pan occasionally. Wait for all of the sugar to be dissolved and in liquid form. Add in butter, followed by cream. Swirl in pan until combined, being cautious with bubbling. Take off the heat and add salt. Combine dry ingredients in a medium-sized bowl and blend together with your hands. Add in butter, working in the dry ingredients until each butter bit is coated and the dry mixture and is in small pieces. Place on a parchment-lined baking tray and bake until golden brown and crisp, about 10 to 15 minutes. Let cool. In a 4-quart pot, whisk together sugar and water. Bring up to a simmer on medium heat, looking for all of the sugar to dissolve. Add in vanilla and let cool. Slice cake layers in half. On a cake pedestal, place a cake board or square of parchment. Place the first cake layer (bottom/flat side of the cake) on the board and brush with simple syrup to lightly coat. Add a coating of buttercream, followed by a few sprinkles of cooked apples, cinnamon streusel, and a drizzle of caramel. Repeat two more times and finish with the other flat cake size. Create an event crumb coat on the outside of the cake and refrigerate for one hour or overnight. Heat up caramel until just warm and pour over the cake, using an offset spatula to guide over the sides. Add some decorative crumbs nad apples on top and serve or refrigerate uncovered overnight.